Garages and carports help to improve the appearance of a home and provide additional storage for cars and other items. You need to undertake careful planning and consider certain important factors when building a garage or carport. An excessively large garage takes up usable space on your property while a very small garage limits your uses. One of the most important factor in knowing how to build a carport is proper planning. Most single-car garages measure 12 feet wide by 22 feet long. In addition, the minimum size of a two-car garage is 18ft wide by 22ft long. These are the recommended minimum garage door dimensions for individuals who plan to limit their storage primarily on automobiles, leaving little room for walking. Make a list of all the items that you would like to store in your garage. Common items stored in garages include sports equipment, lawnmowers, and tools among others. Put these items in mind when determining the size of your garage or carport. Creating the list of items to store in a garage can also help you determine if your garage requires shelves. Consider the size of the vehicle you would like to store in your garage. Measure the size of the vehicle with doors open and closed. Consider if you will need a bigger vehicle in future. If you will be storing additional items in the garage such as boats and trailers, consider the size of these items as well. Determine the amount of space you need in your garage with all items present. Park your vehicles in an open area and then place all the items you plan to store in your garage around the vehicles to determine the amount of walking space you will need in your garage. Leave at least four feet of space between each vehicle. Measure the total amount of space covered by the vehicles and the items. Find out how much land will be left available after you have built your garage in your property. 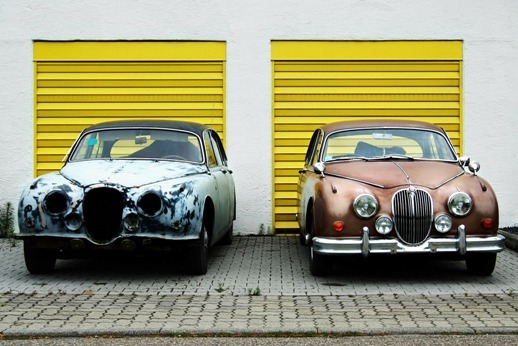 Make sure your garage is not too close to adjacent properties in your residential area. If your house is located in the country, determine the extent of vegetation clearance to be done to create enough space for the new garage. A carport provides adequate vehicle storage for people whose homes are not large enough to accommodate a garage but still want to protect their vehicles from the elements. The design and dimensions of your carport will be determined by your area’s locality. Consider your neighborhood’s by laws, community rules, and state building codes when building a carport. Some states require carports to be fully open on both sides while others do not require carports to be open. State laws also determine the type of lumber grade that will be used on the framing of the carport. Some of the most common carport hardware include copper, silicon bronze, galvanized steel and stainless steel. Concrete used on the base of the structure should sustain pressures of at least 2,500 psi. Why Choose a Precision Airflow Control System?